Speaking to Unzipped: Gay Armenia blog, Micha Meroujean, Chairman of AGLA France, announced the closure of this prominent Armenian gay rights organisation. Sad news for anyone directly or indirectly related to AGLA France. Sad news for anyone who cares about LGBT rights in Armenia. It was several years ago, when I googled “gay Armenia” and found AGLA France and GayArmenia.com website run by the Association. 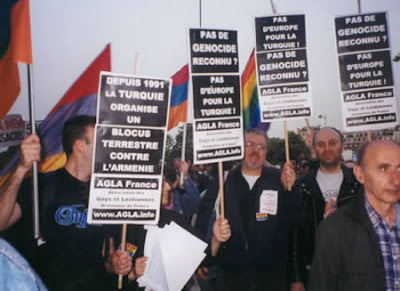 AGLA France was the only Diaspora organisation directly connected and involved in Armenia related gay rights issues. As Burma’s detained prominent human rights activist Aung San Suu Kyi would say, “Please, use your liberty to promote ours". Of course, ‘liberty’ is very relative notion in this case since although living in much more tolerant French society, Diaspora LGBT Armenians have too had problems arising from conservative traditional Armenian families and communities – not exactly the most gay friendly environment, to say the least. However, I felt kind of secure by the fact that AGLA France exists. It felt like you are a child and you could always rely on your parents, you feel safe that they exist, you feel that you are not alone, you will get support when needed. It was fun place too, a place to meet other LGBT Armenians. "Aglushka", as some would lovingly refer to AGLA France in Russian. Well, it’s time to grow up. Artmika: I assume AGLA France was established for reasons. What were the reasons back then and why you decided to go forward with setting up gay rights organisation within Armenian Diaspora in France? 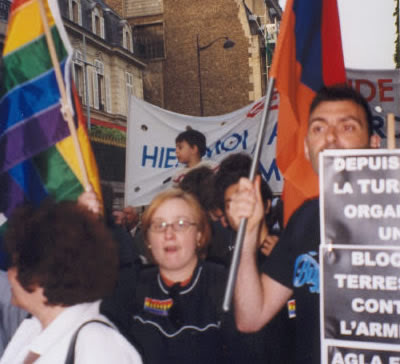 Micha Meroujean: My personal motivation for founding AGLA France back in 2001 was the widespread homophobia in Armenia. I, myself, fled Armenia in early 90s to find "security" in the West. It took me years to get my refugee status in Europe as a gay asylum-seeker. During many years I was indifferent to what was going on in Armenia, until once I stumbled on a news article about hate crimes in Armenia. The article was informing that in 2001 there were seven gays murdered in Armenia without specifying if all the victims were subject to a hate crime. That news shocked me and also has awakened my conscience. I said to myself that something needs to be done to change the situation in Armenia. This is how I started to look for other gay Armenians in Paris in order to establish an LGBT group. When AGLA was finally founded in December 2001, I realized that the Armenian Diaspora and the Parisian community, in particular, was very hostile to us. So we also decided to come out in the community and fight homophobia here as well. And especially to promote public awareness on our issues. A: So what has changed now? What were the reasons behind the closure of AGLA? M: I've been the Chairman since the very foundation. Last year, I asked our members to replace me since I was having difficulties to keep the activity going on. Being a leader of an organisation requires lots of time and personal implication on almost daily basis. Sometimes, it's a full time job (LOL). Unfortunately, nobody wanted to take these responsibilities and replace me, so I asked to close the organisation. It was a very difficult decision to take. A: What would you consider the main accomplishments of AGLA France? Is there anything you are especially proud of? M: There is nothing to be proud of. Unfortunately, there is lots of work yet to do in terms of LGBT rights in Armenia. We didn't really succeed to create an organisation in Armenia, neither to boost a gay movement. But there are many gays and lesbians who are eager today to make the step and start a group. I'd say the existence of AGLA has definitely changed the way gays were looking at themselves before. I mean the fact that there was Armenian LGBT group, even though in Spiurk (Diaspora), fighting homophobia and pressing the Armenian government, has changed the mindset and encouraged many to a better self-acceptance. The biggest achievement of AGLA is that we were the only Diaspora organisation doing pressure on the Armenian government and authorities in order to defend a minority group. 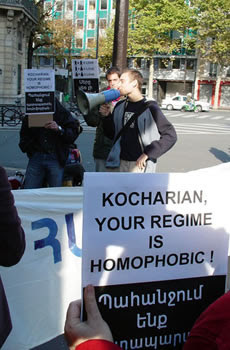 When in 2003-2004 Armenia was caught up by ugly homophobic campaigns orchestrated by the leading political elite, we have used all our connections and networks to put pressure and we went also picketing in front of the Armenian embassy here in Paris. Nothing like that ever happened in Spiurk. AGLA also has co-sponsored the participation of the gays and lesbians from Armenia in the European LGBT network. 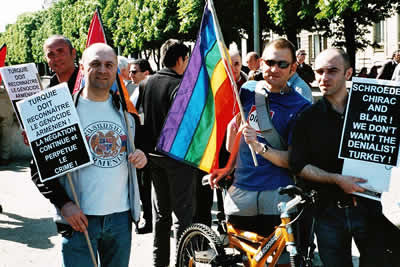 For example, in 2005 we have invited two gay delegates from Armenia to participate in ILGA-Europe conference. Since then, some young gay people in Armenia now want to establish gay groups, and they take part in the European networks. 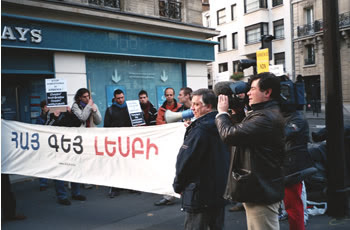 In France, AGLA has been actively participating in the Armenian community's life. Meeting other associations, organising cultural events, fighting against the "genocide denialism" as well. During 4 years we have marched each 24th of April with Armenian and Rainbow flags. It was important to us that the local community sees gays and lesbians and accepts them. Many Armenian parents are rejecting their gay children here in the community. So we wanted to show to the parents but also to the children that you can be Armenian and gay at the same time and there is nothing to be ashamed of. We had also the support of many progressive local French-Armenian intellectuals. That was also a good point. A: Now the opposite question, I suppose. Was there anything particular you regret you did not push for, you were not able to accomplish? M: My biggest regret probably is that I didn't succeed to open the gay and lesbian center in Yerevan. But even now, after the closing AGLA, it still remains my dearest and also very personal project. I don't know yet how, but I'll try to help local LGBT people to build their center. There is a huge need for that. A: Will you keep accessible AGLA France website with all its news, reports, forums etc? I think it will be a great pity to lose it, since it's a part of our history and contains important factual material. And what will happen with GayArmenia.com, AIDS Prevention in Armenia and The Pink webzine which are being run by you? M: The website (including the AIDS prevention pages and the Pink webzine) will be archived and most probably remain accessible to visitors for at least another year. But the board has decided to remove some photographs and personal information from the existing content. GayArmenia.com will be separated and I'll take the domain name in order to create a community website - meeting place, social network - for the LGBT Armenians around the world. That's my next web project. A: I know, there has not been yet an official announcement on closure, but what sort of reaction, if any, you got from within community, from people you worked with? M: Most of people who heard about the closure of AGLA France have expressed their sadness. For many it was a surprise. A: Why do you think no one expressed the desire to continue your work? M: I think the main reason is that being a chairman requires lots of time investment. Another reason I think is that not many are ready to be in a public eye and assume the responsibilities it requires. 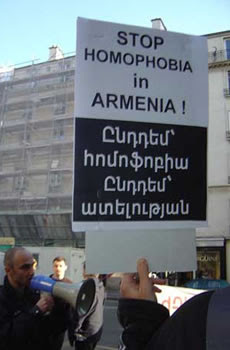 I still think that the homophobia issue is still critical among Armenians. On the other hand, we have done lots of awareness work and the attitude of the community towards gays is not the same as it was in the beginning. Today it is much easier to be a chairman of AGLA then back in 2001. But still you should have a motivation and some courage to be a leader. Motivation comes first! Looks like we found no motivated people among the LGBT Armenians of France. Sad for us! A: Any reaction from sister-organisations – GALAS, AGLA NY and so on? M: As you know, we didn't announce yet officially, so there are no reactions. May be we will get some feedback after this interview is published. A: You have unique experience and insight of both Armenia's and Diaspora's LGBT life. What are the most urgent and practical steps need to be done to develop gay rights movement in Armenia and Diaspora? M: I think today Spiurk and Armenia are more connected and interacted than it was 15 years ago. In my view, the urgent actions should be taken in Armenia. The Diaspora Armenians, no matter where they live, they are dependant on the local situation. For example, being gay in France, US or even in Lebanon is much easier than being gay in Armenia. The Diaspora gay Armenians benefit from achievements of local gay movement while in Armenia there isn't any movement. There are some underground activities but no action on the surface. The urgency is to create an atmosphere in Armenia where local gays and lesbians can get together and create their groups. It's not only about activism. Not all gays and lesbians want to do activism; some want just get together and have fun. Even for this objective nothing exists yet. I think if there would be a Gay and Lesbian Center for non-profit organisations, if there would be some magazines, newspapers for LGBT people the situation will start changing. For the time being the whole gay community is in the closet. What's urgent today is to get the Armenian LGBT out of closet! A: What is next for you, Micha? Any personal or activist plans? M: As I said, the dearest project would be the opening of the LGBT Center in Yerevan, and my next web project is GayArmenia.com - an online meeting place. A: And the last question. When can we expect a formal announcement from AGLA France? A: Many thanks, Micha! Good luck and, please, keep posted on developments. great article...it is sad that the Paris group is not as active as it used to be, but thankfully groups in LA & NY are picking up the slack! This is sad news. I find especially the reason why AGLA is closing shop disappointing: That there is no one willing to take up Micha's responsibilities. It shows the problem of an organisation that depends so much on one person. I wish Micha success with his other projects! It was very important for us gays living in Armenia. And Misha did know how difficult and closeted life we have here. Things do not change to the better here, in terms of tolerance towards gays; things are getting different but the homophobia in the society remains. And Misha’s dream-child, an association of gays in Armenia might be a way of educating this society which is hostile to gays yet has a very high hidden percentage of homosexuality. I think, however, that there are other ways of developing the “homotolerance” in this country. The analogy is the development of economy of a country –the private sector must develop to boost the economy of any country. I think this will hold true also for this case. Just having an association or a centre for gays would not advance move things much. Whereas creating gay-friendly, to start with, and fully gay establishments run by private investors could create a degree of tolerance in the society which would eventually bring about a cultural change in Armenia. The creation of “gay infrastructures” supported by powerful gays (there are lots of them in the country; we surely could not possibly expect them to come out but we could get their support for our cause), the establishment of gay cafés and restaurants, bars and saunas, even cruising bars, would be much helpful than any association. Guys, you're all doing a great job. But PLEASE be careful even in the West not to speak about the "motherland" ! Thanks for your courage I'd never had ! R.
Is AIDS stigma diminishing in Yerevan? New French anti-AIDS campaign ad - striking!